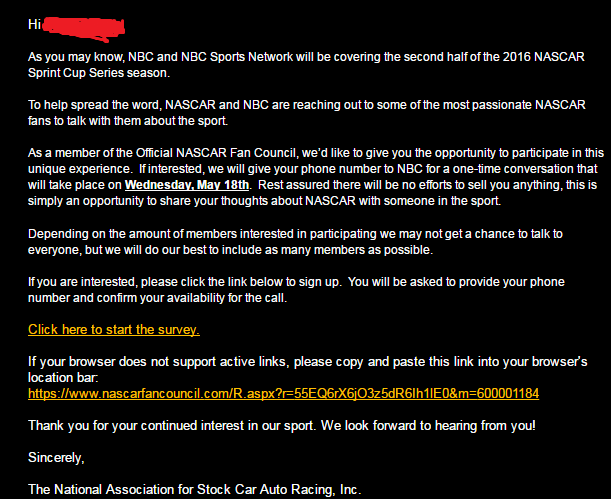 If you are a member of the NASCAR Fan Council check your inbox. Take the survey before they remove it and let your voice know about what you witnessed this past weekend. If you liked it, fine. If you didn't speak up. Don't forget..... If you miss the deadline for the survey you can still log in any time you want and make your thoughts known. Johali, ToyYoda and DUN24 like this. Any way it could be posted for those of us still trying to get on the list? I spoke up -- loudly. Expressed my thoughts about the heat races in no uncertain terms. sdj, [email protected] and Johali like this. Can I assume the only positive comment you had was something like, "Thanks for trying it but it ain't working"? Yep, and the caution clock also. Something along those lines -- along with "a waste of my time"
Haven't received this week's survey just yet though. I made to sure to remind them how much I dont like the caution clock, the words stupid and hate might of been used. I just told them this crap better not make it to the cup series or my wife will be happy that I have free time on Sundays. I also gave them hell for the caution clock! I said I feel like I'm wasting my time and I'd never pay to go see that crap. If I wanted to see proper heats and main I'd go to my local dirt track. I'm convinced they already have a caution clock in the cup series. It is just set a 60 mins instead of 20. That or there is a half time caution that they have instituted. Or, bringing softer tires that degrade more leads to more wrecks. More tire wear=more blown tires=more real cautions=no caution clock. What's so hard to understand? Wear across the surface of the tire does not result in failure. They're changed long before the're down to the cords. Tires fail due to excessive heat caused by aggressive camber gain, brake heat, puncture, contact or because they're mis-manufactured. FLRacingFan, Charlie Spencer, Zerkfitting and 1 other person like this. It's a new era of fans who's thought process have passed me by. The 2nd half of each race has certainly played out like that, but the first half of each race hasn't quite seen the cautions for blown tires, wrecks, etc. I don't want the caution clock at all, but I have certainly noticed a trend that they seem to throw a caution once an hour or just before the halfway mark. Maybe once the clock hits zero they look for any excuse to throw the caution instead of immediately throwing one. Either way, the softer tires are making the racing great. I can't tell if the racing is better because of the softer tire, or the lower downforce, or a combination of the two. Right now I'm leaning toward the softer tire that is giving us better racing. Right now I'm leaning toward the softer tire that is giving us better racing. Me, too.The air is still dirty. ^ I lean toward "a combination of the two." The air is still dirty, but less dirty, IMO. FLRacingFan, LouieLouie and Charlie Spencer like this. I like the *idea* of heat races and a main for some tracks. But it won't work unless the heats have a substantial reward, such as making the main or failing to make it. And the charter system is gonna preclude doing that, I suspect. FLRacingFan and LouieLouie like this. Right, kind of hard to have eliminations when you have teams that are guaranteed to start the race, unless its just for the four open spots. When you get to the big time, you leave heat racing behind. Besides, the nonsense going on in the B isn't heat racing. Cars have gone home ineligible to run a heat. It's an embarrassment. Oh I completely agree, heat racing needs to stay at the local short track and not come to NASCAR's top three series , it does not belong there. That one showed up in my inbox today . I told them to call me if they want to. I'll give them an ear full. I loved the idea. I dislike the reality. I'll get my call Friday morning between 10:30 and 11:30 AM. I'm practicing my speech. jws926 and TexasRaceLady like this. How long did it take for them to let you know?, meaning when did you your invite to when you got confirmation? About a day. I don't remember for sure. Give em hell from me too. I wasn't available during their time frame to take part in a phone call. Got my survey today about the race. Let them have it with both barrels about the confusion and lousy officiating. However, I did offer praise about the tire fall off and the ability to pass. jws926 and BobbyFord like this. I agree , I think it's quite obvious they are going to do what they are going to do .